Vemedio said Thursday that its Snowtape application for Internet radio recording now features an online radio directory that automatically updates once new stations are available. More than 750 radio stations have been added so far. 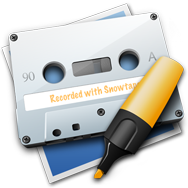 Other changes introduced in Snowtape 1.1 include a revamped user interface and scaling cover view. The new release is compatible with Mac OS X 10.6, the forthcoming Snow Leopard update. Humble Daisy’s ProfCast is a presentation recording tool for professionals and educators. The software helps you record lectures, including PowerPoint and Keynote slides, then publish them as podcasts. A new 2.6.0 release of the recording application offers bug fixes while adding the ability to publish recordings directly to a Podcast Producer installation. Podcast Producer is Apple’s podcast processing and publishing system. SQLiteManager updated to version 3. SQLabs has released SQLiteManager 3.0, a new SQLite database management software application. Priced at $49, the software helps you open and work with SQLite 2 and SQLite 3 databases, in-memory databases, AES 128-encrypted databases and REAL Server databases using a GUI. It lets you create and browse tables, views, triggers and indices.